Epic arrangements, fascinating hooks and a technical standard looking for its peers. 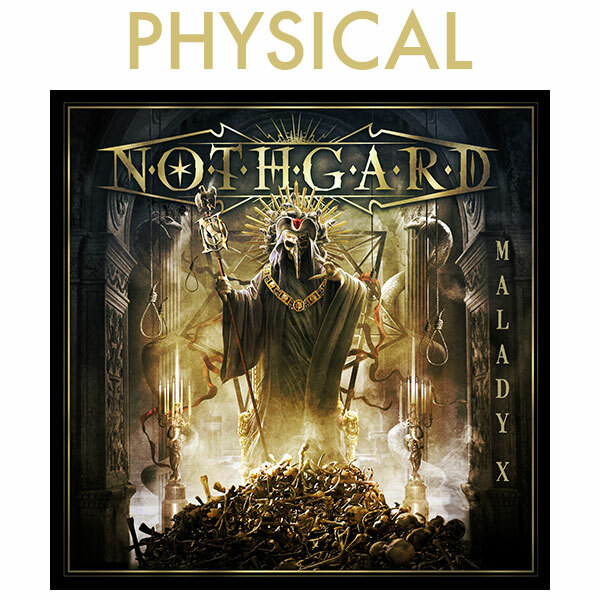 NOTHGARD, the band founded by singer and lead-guitarist Dom R. Crey in 2008, is acting on this maxim. Their debut 'Warhorns Of Midgard' (2011) already lays a remarkable foundation. Their melodic death metal with its sophisticated combination of the technical qualities within the guitar work and the epic orchestration fascinates fans and critics alike. The following albums 'Age Of Pandora' (2014) and 'The Sinner's Sake' (2016) broadens this basis yet again which makes the last-mentioned enter the official German album-charts. In April 2018, the quartet announces a multiple album deal with Metal Blade Records who will release their upcoming record 'Malady X' on October 26, 2018. 'Malady X' opens a new era for Nothgard. While they keep their stylistic elements, they more than ever count on their unique musical features and sound wise take a further step towards perfection. The compositions on 'Malady X' set the bar higher and the sound had to follow. The band itself did the recording and mixing. The watchful eyes of Dom R. Crey (Def-Creation Studio) and rhythm guitarist Skaahl (Southern Deathcult Studio) always paid attention to the details. Thus, they ensured that all the renowned guests were able to express themselves in the best way: Besides many others Noora Louhimo (Battle Beast), Veli-Matti Kananen (Kalmah) and Jen Majura (Evanescence) made their appearances. The final mastering was done by none other than Jens Bogren (Amon Amarth, Kreator, Arch Enemy a.o.) who leveled the songs even more up. Dom R. Crey states: "We are super happy with the outcome of MALADY X. Never before, we took so much care about all the details and the arrangements. We have never worked harder on any album before but it was absolutely worth it!"